Milan, Italy is a sometimes overlooked travel destination. But the city offers many attractions and reasons to visit, some of which I'll explore here. When most people think of taking a vacation in Italy, they think of the major romantic, historic and artistic destinations such as Rome, Venice or Tuscany. But for an avid lover of all things Italian, there is no reason to overlook the important city of Milan, which is the second largest city in all of Italy today. Milan (or Milano in Italian) is thought more of as a commercial and business center of Italy than a tourist destination, particularly as the city suffered extensive damage during World War II. Even so, one will find incredible art treasures in Milan - a city where Leonardo da Vinci left a significant mark and influence on many artists who followed in his footsteps. Milan is also close to Northern Italy's magnificent Lake District, easily reachable by rail or by road. Milan is a very metropolitan, modern city with much to enjoy for those who love fine food, trendy shopping and various forms of entertainment. In 2011, I spent five days in Milan during a two-week vacation split between several wonderful Italian destinations. Let me share with you some of the reasons why I think you should try to spend some time in Milan in the future as well. Photos on this page are by the author, sockii, unless provided by Amazon. What makes Milan a unique city worth experiencing? Milan has always been important in the history of the Italian peninsula, given its location as a "gateway" to the rest of Italy. The city and its surrounding region of Lombardy have seen centuries of conflict, battle and changing rule, as at various points in history it was controlled by the Celts, Romans, Goths, Lombards, Spaniards and Austrians in turn. It became part of the Roman Empire - indeed, the capital of the Western Roman Empire - after being conquered in 222 B.C. However, in the 6th century A.D. the Lombards gained control of Milan, and by the 8th Century it was beginning to see a rebirth which continued into the 12th century when it became a feudalism. Two families were then to shape and control Milan's development and fate in the centuries to come and through the Renaissance: the Visconti and the Sforza. 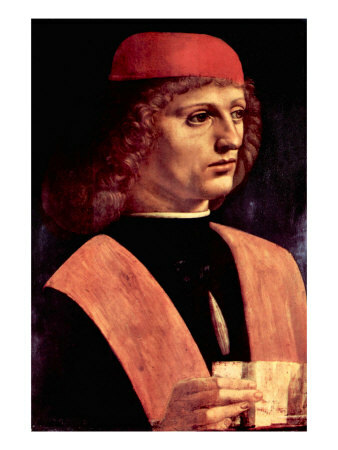 TheVisconti would seize control of the city in 1277 and rule over it for almost two centuries, ending in 1447 with the death of the last Visconti Duke, Filippo Maria. After a brief period of turmoil, Francesco I Sforza would gain control of the city and the House of Sforza would rule Milan through the Renaissance, leading it through a great period of growth - much as the Medici did in Florence during that same time. Exterior of the Sforza Castle in Milan. When the last Sforza Duke died in 1535, however, Milan fell into a lengthy period of control and administration by foreign powers: first the Spanish and then the Austrians, and next Napoleon in 1796 - and after that again the Austrians after the fall of Napoleon. The Kingdom of Italy was not formed until 1981, at which time Milan was set to be declared the "cultural and economic capital" of the Kingdom. Many of the great monuments and buildings of the city, such as the Galleria Vittorio Emanuele II, were built in celebration during this time. Through the early and mid-20th centuries, however, war would take its toll on the city once more. The Fascist party was formed in Milan in 1919, and during World War II the city suffered tremendous damage from bombing. The end of fascist rule was celebrated in 1945 when the bodies of Benito Mussolini and other just-executed fascists were taken to the Piazzale Loreto in Milan for display - and graphic attack by the crowds. After World War II, Milan was rebuilt and prospered once again. Now a republic, Italy saw a great economic boom and transformation in the post-war years and Milan was right in the center of it all. Today, Milan is a bustling, fast-paced modern city and home to industries from fashion to technology to automobiles. Think of Milan as Italy's "Big Apple": a city that doesn't sleep, where cultures from around the world combine, where history and modernity meet and are at home together. If you're a history buff and wish to learn more about the Visconti and Sforza families, you may wish to read this academic study before visiting Milan. Just how did these families seize power, exploit it to their benefit, and eventually abandon their roles as leaders of the city? Author Jane Black attempts to answer these questions in this important volume. 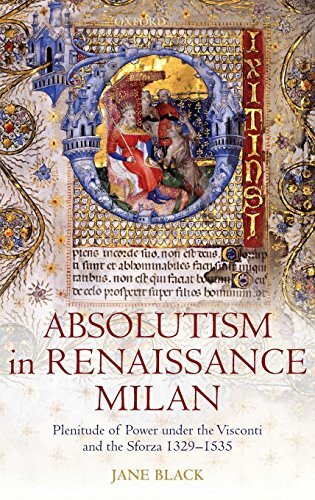 Looking at important events and legal matters during two centuries of Milan's history, the author gives a detailed view of how these families in turn gained "absolute power" over the city but eventually that control was abandoned by the last Duke of Milan, Francesco II Sforza. One of the world's greatest art treasures is in Milan - and it cannot travel elsewhere! For art lovers, there is one thing in Milan which makes the city an absolute must to visit at some point in your lifetime: Leonardo da Vinci's famous fresco of "The Last Supper". Some believe or think there is not enough of the original fresco remaining to make it worth seeing today; however, I can state from personal experience that experiencing even what remains is incredible and moving. The emotional intensity and genius of the work remains today and cannot be appreciated in mere photographic reproductions. 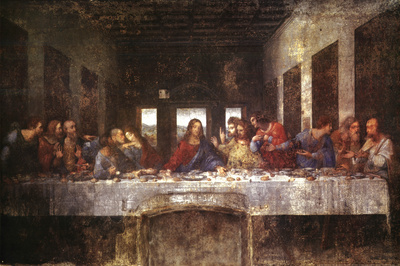 One of the most recognizable works of art in the world, Leonardo Da Vinci's "The Last Supper" is a must-see while in Milan, Italy. But getting in to see it can be difficult without advance planning! "The Last Supper" is a remarkable artistic work in many ways - including the fact that it is a miracle that any of the fresco survives today. Da Vinci, ever experimenting and trying new techniques, did not follow traditional fresco painting techniques when creating this work, and as such it began to deteriorate almost from the moment it was finished! Through the centuries it suffered much abuse, from misguided attempts to repair it to soldiers throwing rocks at it. In 1978, Pinin Brambilla Barcilon began a 20-year project to carefully restore the fresco as best as possible to remove others' previous attempts and allow as much of Da Vinci's original work left to be seen anew. It was a remarkable project which allows visitors today at least a glimpse of Leonardo's genius as has not been seen for centuries. 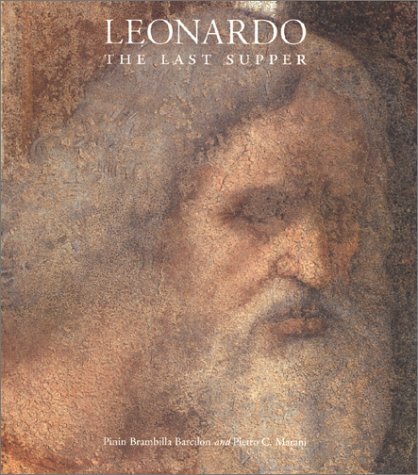 This book is the official document of Pinin Brambilla Barcilon's restoration of "The Last Supper". 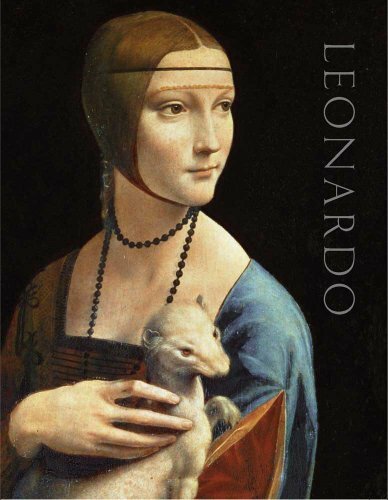 With full color photographs showing Leonardo's handiwork versus the watercolor application of the restorer, it's an incredibly valuable record of how the restoration took place. 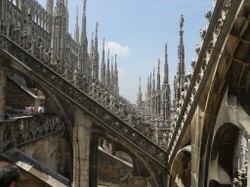 The Duomo di Milano, or Milan Cathedral, is certainly a must-see attraction in the city. This huge Gothic cathedral is the largest in the entire Italian state, and the fifth largest in all of the world. Construction of the cathedral began in the year 1386 yet it was not completed until 1965! To learn more about visiting the Duomo, booking guided tours or learning about its museum, visit the Official Duomo di Milano website. Located right near the Duomo in the Historic Centre of Milan is the Galleria Vittorio Emanuele II - perhaps the most incredible shopping mall you will ever see. Even if you can't afford Prada, Gucci or Louis Vuitton, it is worth strolling through the Galleria for the experience (and perhaps a very expensive espresso or meal while people-watching). The Galleria Vittorio Emanuele II was built between1865 and 1877 by Giuseppe Mengoni and is named after the first king of the Kingdom of Italy. The four-story high arcade is covered with a roof of glass and cast iron, creating a dramatic and exciting space. Clothing designers, bookstores, art galleries and more can all be found here, making it well worth a visit even just for window-shopping and experiencing one of Milan's most recognizable places. When the Sforza Castle was began in the 14th century, it stood in a woodsy district outside of the city walls of Milan. The area was transformed beginning in the 19th century, with plans to turn it into a monumental quarter of beautiful buildings and gardens. Today it is a lovely area to plan to walk and explore, with the English-style, 116-acre garden Parco Sempione, the Arena Civica, the Triennale Design Museum and of course the Sforza Castle itself. Enter the grounds of the Sforza Castle and imagine Leonardo himself there in centuries past, along with many other great figures of the Renaissance. You can explore the Castle today and visit several civic museums inside, including collections of Ancient Art, furniture, applied art, and a pinacoteca with important works by Antonello da Messina, Giovanni Bellini and Filippo Lippi. Perhaps the most important work to see in the museums is Michelangelo's last work, the Rondanini Pieta, which some see as a fascinating forerunner to modern sculpture - or is it simply an unfinished, "ruined" piece? View it for yourself and decide. After finishing in the Castle and exploring the nearby gardens, you might want to take a stroll down the Via Dante, an elegant pedestrian street lined with outdoor cafes. Milan has several outstanding art museums well worth visiting, whether you are a lover of classical painting or contemporary art. This art gallery is considered one of Italy's most important, and I would say is a "must see" while in Milan. 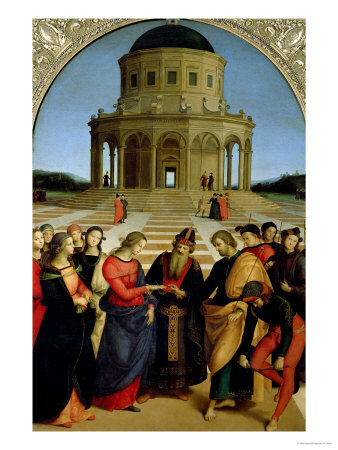 It features important works by Italian artists from the 13th through the 20th century, such as Raphael ("The Marriage of the Virgin" shown here), Piero della Francesca, Mantegna, Crivelli, and Caravaggio. 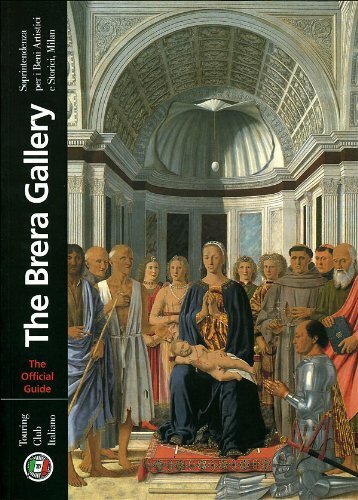 Be sure to find out what special exhibits might be taking place during your visit as the Brera often hosts important ones. This art gallery, founded in the year 1618, houses a number of very important works for lovers of classical art: Leonardo da Vinci's "Portrait of a Musician" and Codex Atlanticus, Raphael's drawing for "The School of Athens", and Caravaggio's "Basket with Fruit". This collection of 19th century art is housed in a beautiful neo-classical villa. Here you will discover works by Picasso, Gauguin, Modigliani, Van Gogh and other important modern artists from Italy and around Europe. This museum houses the personal collection of Giacomo Poldi-Pezzoli, a wealthy nobleman who willed his collection to the state upon his death in 1879. It is considered one of the most important "house-museums" in Europe and the collection includes notable works by Mantegna, Botticelli and Piero della Francesca. Opened in 1778, this is one of the world's most important opera houses where lavish productions are still staged today. Even if you don't fancy attending the opera, you might want to check out the on-site museum where you can see historic costumes and stages and learn more about the history of theater going back to Roman times. More commonly known as San Satiro, this church was once an important destination for religious pilgrims and is one of the most lovely examples of Renaissance architecture standing today in Milan. Are you a football (that is, soccer) fan? Then attending a football game at San Siro stadium is an absolute must! It is the home stadium for both A.C. Milan and the Football Club Internazionale Milano teams. There is also a museum on-site celebrating the history of Inter and A.C. Milan and a tour you can take of the stadium itself. Nearby attractions and cities to visit by train, boat or car. While there is much to see in Milan proper, if you have more than a few days in the city then it would be a shame to miss some of the wonderful attractions in the rest of Lombardy. Many of these destinations can be easily reached by train, and are worth a day trip or possibly a few nights' stay, depending on your time or interest. The "Lake District" north of Milan is an absolute must to visit, if you are planning on staying in the area for more than a few days. 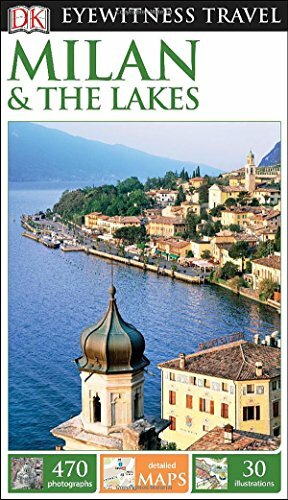 Indeed you may wish to book a hotel in the area itself for further exploring: all three of the major lakes (Como, Garda and Maggiore) are served by Navigazione Laghi ferry services, making it easy to get from one attraction to the next on the lakes via the water: a very scenic way to travel! Isola Bella is a magical place to visit, if exploring the Lake District of Northern Italy. Learn about getting there, what to see, and enjoy my photographic tour of the island. Pavia is only 35 kilometers south of Milan and during the rule of the Lombards, from 568 to 774 A.D., it was the capitol of the region. As such the city today remains extremely historical and with many monuments to see, a civic museum, art gallery and the Cathedral of Pavia - which boasts the third largest dome in all of Italy. Certosa di Pavia, just north of the city, is considered a marvel of Renaissance architecture, with amazing frescoes, reliefs, and lavish altars decorated in semiprecious stones. Just northeast of Milan is Monza, the capital of the new province of Monza and Brianza. A historic holiday destination due to its scenic location, there are many sites to see including historic churches, fortifications and villas. The Autodromo Nazionale Monza racetrack also makes Monza a popular city for Formula One racing enthusiasts. About 40 kilometers northeast of Milan is Bergamo, at the very foot of the Alps. Bergamo retains much of its historic appearance as a medieval village, with the "upper city" connected to the "lower city" by cable cars and footpaths. Many historic palazzos, churches and castles attest to the city's importance in the past. Car enthusiasts may wish to visit the Alfa Romeo car museum in nearby Arese, where one can view over 100 automobiles from the famous manufacturer. Books to study before your visit - and to carry with you! 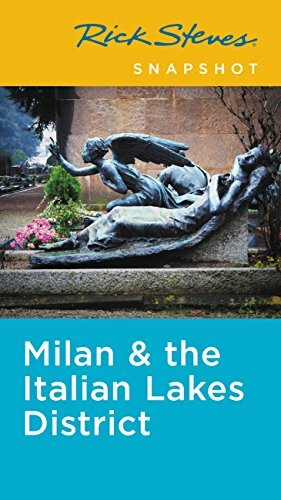 Although I have guided you through some of my picks for the places to see and things to do in Milan, these books will provide far more information and are worth your time reading, if you might be planning a trip in the future. This is the guidebook we took with us on our Milan visit and we found it extremely useful and thorough. You'll find all of the major attractions covered here along with useful "cutaway" maps of the major buildings, historic information, and practical recommendations for lodging and dining. The section on the Lakes is very good as well, with maps indicating the main road, rail and ferry routes around each. For those who love lists, this is the simplest and best travel guide for you! 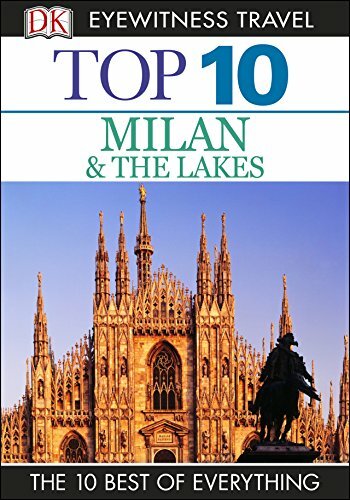 It breaks down the "Top 10" of all things Milan, such as the Top 10 Lakeside Attractions, Top 10 Artists Working in Lombardy, and Top 10 Attractions for Children. Rick Steves "Snapshot Milan" for your Kindle (or in paperback format) makes for perfect reading on the plane or during your travels around Italy. It is full of practical information (like how to try to get in to see "The Last Supper" if you forgot to reserve in advance) and how to maximize your time in Milan to see the major highlights of the city. The Streetwise series of maps are, in my opinion, the best ones out there for tourists. Heavy-duty and laminated to provide protection against the elements, these maps hold up well to frequent folding and unfolding, and they're small enough to fit in a purse or coat pocket. The Streetwise Milan map has several different maps, including a detailed City Center map, a Metro Rail map and a Milan Area map. Major sites and attractions are indicated and enough smaller streets shown that walking about without getting lost is easy. Being a large metropolitan city, there are of course many different hotel and lodging options in Milan - and many can tend toward the expensive end of the scale given the city sees so many business travelers. After doing considerable research for our trip, I picked the Hotel Berna for our 5-day stay in the city and was completely satisfied with the accommodations. I would give them a strong recommendation for any other traveler to Milan looking for convenience, excellent service, solid accommodations and a reasonable price. Hotel Berna is located just a few short blocks walk from the central train station - making it a great base for your stay if you plan on taking day trips to the Lakes or elsewhere. The rooms are well appointed and free wifi is included, along with an incredible breakfast buffet that has enough offerings you might not even need to eat lunch! The front desk staff was very friendly, proficient in English, and able to make arrangements for taxis for us whenever needed. They even kindly helped me find a box and package up a large item I purchased and needed to transport home safely. If you read the other reviews of Hotel Berna on TripAdvisor, you will see they receive overall great praise from visitors - it is currently ranked as one of the Top 10 hotels out of more than 400 listed for Milan on the site. A small glimpse of the outrageous breakfast buffet at the Hotel Berna. Every morning the Brera's breakfast buffet contains fresh sweet pastries and breads, cheese and Italian deli meats, scrambled eggs and frittatas, marinated salads, a hot chocolate fountain, juice and an assortment of fresh fruits and vegetables for juicing yourself, and of course your choice of tea, coffee or espresso beverages. It is all included in your room rate. Malpensa Airport is the biggest airport in the Milan area and the one you're most likely to be using if you are flying in to the city. It is a very large and busy international airport with frequent connections throughout Europe and some non-stop flights to the U.S. It is also located 50 miles outside of the city center, so hiring a taxi can be quite expensive - the flat rate was 90 Euros the last time I checked, for up to 4 passengers. However, you might need to rely on a cab if your flight connection is very early in the morning, so just be sure to budget for that. Otherwise, there is a frequent express train to and from the airport and Milan, as well as quite a few bus routes that serve the airport. Milan is a very large city so don't expect to be able to explore it all on foot, like you can in smaller Italian cities. Taxis are easy to hail and use for getting around quickly (and many hotels, restaurants and even museums will call a taxi for you if needed.) Otherwise you can use the Metro public transportation network to get around - there are tourist passes availablefor various lengths of time, which will save you money over single-use tickets. Trenitalia is an excellent way to get around Italy and to plan on visiting numerous cities and destinations over the course of your vacation. I find Italian trains very comfortable and efficient, particularly if you take one of the Frecciarossa high speed trains which will get you from Milan to Florence in under two hours, or Milan to Rome in just under three hours. Regional trains can get you to the Lake District in about an hour's time, perfect for "day tripping". If you wish to explore on your own around the area - and have nerves of steel - you can rent a car but I wouldn't recommend it for the average visitor or tourist unfamiliar with driving in Italy. Milan is a city where you can find any type of cuisine you might be craving, from fast food to Chinese and Thai to of course every style of Italian imaginable. Milanese cuisine itself is well worth focusing on as it is typically Northern Italian in style yet with its own unique flair and finesse. Seafood is of excellent quality in Milan, as its fish market is the largest in Italy. Trout from the Lake District is a specialty in many restaurants, whether marinated and served as a cold salad or as part of a grilled mixed seafood platter. Risotto alla Milanese is a classic saffron-infused rice dish, typically served with braised veal shanks (Osso Bucco). You will taste more butter than olive oil in pasta sauces in this region, and travel to the mountains near the lakes and expect to enjoy hearty rustic fare including venison or rabbit stew, home cured meats, woodland mushrooms and delicious cheeses. I'm hesitant to recommend specific restaurants, but would advise you to read my article "Dining Out in Italy" for general advice on how to find a good meal, "eat like an Italian", and avoid the tourist traps in whatever Italian city you might be visiting. You may also want to check out TripAdvisor's Index of Milan Restaurants, where you can find honest reviews by other travelers, lots of photos, and more information. A wealth of information from upcoming events and festivals to locally-recommended restaurants, hotels, attractions and nightlife. Concerts, movies, sporting events, theater and more. Find out what's happening in Milan during your visit so you don't miss out on anything. An official website spotlighting the tourist attractions of the city, including thematic guides such as "Milan for Creative People" and "Leonardo's City". Your articles on Italy seem to have outstanding images, and I have viewed several. It is noce to have you share your pictures. My mother's family is from Finale Emilia outside of Bologna, so I've spent a lot of time in this area. It is everything, you say it is. I think it has the best food in the world.